Chibi-Robo by developer Skip was originally going to be published by Bandai, and featured the little robot defending a house against burglars. Bandai was going to abandon the project when Nintendo stepped in. 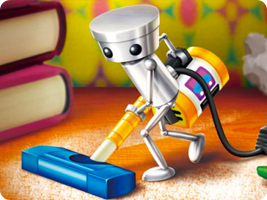 Chibi-Robo's role changed to becoming a service robot, whose goal is to make everybody happy. At first, the small chores you are given award small numbers of Happy Points, but as you become more familiar with the dysfunctional Sanderson household, you have to help keep the family together. 23 Jun 2005 GameCube Chibi-Robo! 11 Jun 2009 Wii Wii de Asobu – Chibi-Robo! 23 Jul 2009 Nintendo DS Okaeri! Chibi-Robo! Happy Rich Daisōji!